The relation of the physical man and God’s final purpose has been absolutely left out. My convictions are, and they are deeply grounded, that man’s interest in the physical man at this present hour is not a maxim, but the natural development that this present hour of necessity brings to the spirit of man. Historians tell us that prior to the coming of the Lord Jesus Christ and His birth as a man, there was a strange “looking forward” on the part of man for an event, for the coming of someone who would bring a new light, new life, new liberty to the world. The Jews spoke of him as their Messiah. The other nations, according to their philosophers, had one also whom they were looking for and whom they are looking for again. For the looking forward to the coming of the Christ by the Christian or to the return of Jesus to this world by the great majority of advanced Christian people has spread very rapidly throughout the whole Christian world during the past few years. There is a reason why the souls of men catch the gleam, at particular times, of a coming event. The spirit that is anticipating and waiting and longing for and believing in the coming of Jesus of necessity has become sensitized along that line and of necessity will catch the fore-gleams of the rising sun. I believe it was that internal condition of the spirit of man that the historians and the scribes speak of as an electrical condition of the minds of men which preceded the coming of Jesus to the earth. I believe at the present moment there is such a condition in the hearts of men throughout the world being repeated. Men are anticipating. They are looking forward to the event that they cannot explain. That “end of the world” expression is a misleading term, for there is no end of the world. There is a new age. And every age has its closing events, and the events are peculiar to that age. Christians speak of the return of Jesus Christ, and the establishment of the kingdom of Christ. What events may precede such a thing we know not, but there is nothing unreasonable in believing that perhaps the thing that all feel is produced by the foregleam of the event to take place. Coming events cast their shadows before. In discussing the subject of the resurrection, he says, “This mortal must put on immortality.” Flesh and blood cannot inherit the kingdom of God. Consequently, a change in the living as well as the dead is an apparent fact. If I were going to give a reason why the attention of mankind is turning to God today for the bodies of men, I would place it right there, in the fact that the Spirit of God or the rays of the coming age are breaking through into the days of this age, and we are anticipating the age which is to come. The very first gleams of the rising sun of that event must discover that it was not in God’s will or purpose for man to live in pain, in sorrow, in sickness, and in poverty. But, on the other hand, it is God’s purpose and intent of Jesus that mankind should be redeemed from sin, from sickness, and from death, bless God. 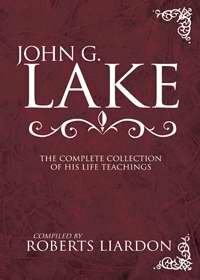 No finer phrase was ever coined to express the real thing that the Spirit of God is accomplishing at the present hour than the phrase “physicalized Christianity.” The secret of healing, the secret of physical healing is contained in this fact that the spirit of man, in union with the Spirit of God, becomes cognizant of the mind of God concerning itself. The gleams of immortality that shine into the spirit are transmitted through the soul into the bodies of men, and that is the real issue, the real secret of real healing by the power of God. I speak of man in the sense that the Scriptures describe him as a triune being—body and soul and spirit. The soul of man has ever been compelled to listen to two voices: The voice of the spirit and the voice of the flesh, or the natural man. Those who have studied the subject at all of what is defined in the Scriptures as the fall of man, long ago, very long ago, arrived at this conclusion: That the fall of man was the descent of man from the control of his spirit, or God-man, into the control of his flesh, or animal-man. And the spirit became to some extent subject to the animal-man. Redemption is the restoration of the spirit of man to his normal place of authority, whereby soul and body become subservient to the spirit, not the spirit to the body. Physicalized Christianity! Bless God for the phrase. It is splendid. It fills a need. It expresses a pregnant thought, the thought that the hour is coming when, through the enlightenment of the Spirit of God, man has arrived at that place in his growth toward (in) God where he begins to recognize that God has a definite purpose for the body and soul of man as well as for the spirit. He who works in the greatest calmness, with the holiest and the greatest consciousness of the Father, is he who permits his spirit to dominate his being, not only working with the spirit of man in control of your personality, but more the spirit of man in union with the Spirit of God, whereby the mind of God and the thought of God for this present hour is understood and is being lived up to. The transmission from the spirit of the thought of God through the soul is a continuous process. The transmission of the power of God from the spirit through the soul and into the body is a continuous process. And the real fact of sickness, the real fact of sickness is simply that somehow a portion of our body loses its correspondence with the rest of our being and is not receiving naturally and normally that sufficient measure of the life of God that other portions of the body are receiving. The intelligent Christian has long since learned that if a portion of his body is not receiving the due measure of life from God that another portion is receiving, it is because there is not being directed to the afflicted portion of the body the due measure of the Spirit that it ought to receive, and that it is the privilege by the Spirit to take the life of God and direct it to any portion of his body that he so chooses. Blessed be God! The climax of such thought is not simply the mere condition of physical healing. It is more. Of necessity there must come a condition of health, not healing. And I look forward with great joy and great hope and great expectation.